Among the works professedly written on architecture, there is none more effective and useful than that by Sir William Chambers: and it were much to be wished that a similar work on the Gothic style could be referred to; but it has been deemed necessary for artists to study the remains of Greece and Rome in those countries, from whence they generally bring back the greatest contempt for the style they call Gothic. The late much-lamented James Wyatt was the only architect with whom I was acquainted who had studied on the Continent, yet preferred the Gothic forms to the Grecian. As the reason for this preference, he told me, about twenty years ago, that he conceived the climate of England required the weather mouldings, or labels, over doors and windows of the Gothic character, rather than the bolder projections of the Grecian cornices, which he often found it necessary to make more flat than the models from which they were taken, lest the materials should not bear the change of weather to which they were exposed in this country: and this accounts for the occasional want of boldness imputed to him in his Grecian designs. In his Gothic buildings, to unite modern comfort with antiquated forms, he introduced a style which is neither Grecian nor Gothic, but which is now become so prevalent, that it may be considered as a distinct species, and must be called modern Gothic. The details are often correctly Gothic, but the outline is Grecian, being just the reverse of the houses in the reign of Queen Elizabeth and King James, in which the details are often Grecian, while the general outline is Gothic. 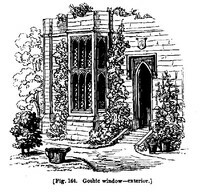 In buildings of that date, we observe towers rising boldly above the roof, and long bower windows breaking boldly from the surface; but in the modern Gothic all is flat, and the small octagon turrets, which mark the corners, are neither large enough to contain a screw staircase, nor small enough for chimneys: yet this style has its admirers, and, therefore, I have inserted a specimen, although I conceive it to be in a bad taste, and have placed it betwixt the Grecian and Gothic fronts of D and F [see fig. 154, p. 412], not knowing to which it more properly belongs. If a door, or window, or even a battlement, or turret, of the true Gothic form, be partially discovered, mixed with foliage, it stamps on the scene the character of picturesqueness, of which the subsequent vignette [fig. 164] may serve as an example; and thus the smallest fragment of genuine Gothic often reconciles to the painter its admission into the landscape; even although the great mass of the building may offend the eye of the antiquary, or man of correct taste, by its occasional departure from the true Gothic style.